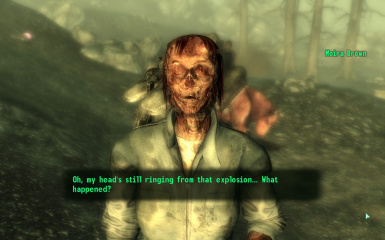 Keeps ghoulified Moira's special dialogue available if you complete The Wasteland Survival Guide before talking to her. If you opt to destroy Megaton by blowing up the nuke at the center of town pretty much everyone inside will perish in the blast, save for two people: Jericho (potentially) and Moira. Moira will be ghoulified, and there is special dialog for the Lone Wanderer which allows them to comment on her new appearance. Unfortunately, that dialogue is only available if the Lone Wanderer has started but not completed the quest "The Wasteland Survival Guide". If the Lone Wanderer has, Moira's special dialog will be completely unavailable. As a consequence, she will not ever leave the Megaton Ruins, standing outside them until her ultimate and inevitable demise. As it turns out, the bug is caused by a feature of the Gamebryo engine: all dialog is associated with a quest. If that quest is no longer running, the dialog is no longer available and will not be offered. Since The Wasteland Survival Guide stops running on completion, and doesn't start running until you talk to Moira, the dialog is not universally available. On first appearance the fix seems simple enough: move the dialogs in question to a different quest. Unfortunately, that changes the name of the sound files that the game looks for when trying to play them back, due to the way the engine works. Part of the filename is taken from the EditorID of the quest itself. Because of this, I've made a somewhat dicey workaround, dicey in the sense that there was no way I could have done any of this in the GECK. Thankfully, FO3Edit exists. Moira's special dialog is now associated with a completely new quest that has the exact same EditorID as the existing Wasteland Survival Guide quest. The quest starts when the game starts and remains available throughout the rest of the game. Consequentially, Moira's dialog topics concerning her ghoulification and the destruction of Megaton are available even The Wasteland Survival Guide has either not started or has been completed. If this bug fix is incorporated into a compilation, any edits to the compilation made using the GECK will require this quest's EditorID be restored afterward in FO3Edit. This is because the GECK will automatically change the quest's EditorID to "MS03DUPLICATE000", which will cause Moira's dialog to be unvoiced.